(1) Resonance of things and their suffocation : suite of sound images, of resonance lost in the acoustic space… an exploration of the non-existence of the silence and its saturation. (2) Dispersal of the musical energy : Construction of a musical continuum, where we attend in the progressive deterioration of the ideas renewing the speech and in the impoverishment of the sound language, by way of the progressive abolition of the tools of expressions. 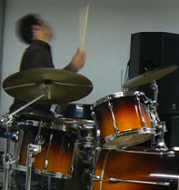 (3) “Même en dehors du normal”: Explicit drums powered resistance. The underground sprawl of energy brought in for each performance traces the evolution of speech, and shows the different layers of exhaustion explored.